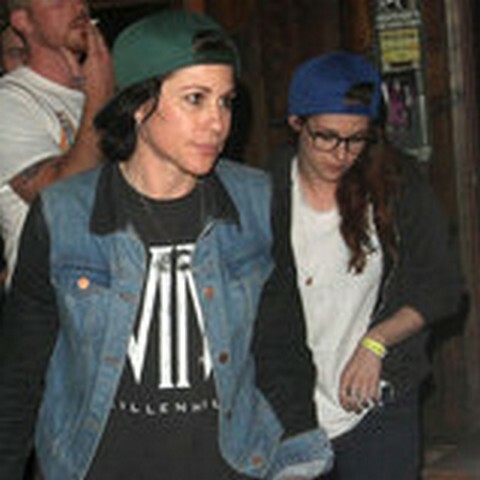 Kristen Stewart’s new friendship may be a new romantic relationship. The National Enquirer is reporting that Kristen’s new friend Tamra Natisin (Katy Perry’s assistant) are more than friends. The two women have become fast BFFs, so that must mean they are in a lesbian relationship. An insider told The National Enquirer “Rob will hit the roof when he sees photos of Kristen and Tamra hanging out together. It’s obvious to all of her friends that there’s a romance brewing between them.” The magazine alleges that Kristen paid a lot of attention to Tamra at an event on March 3 and they spend all their free time together. The source also said Kristen doesn’t act like she misses her boyfriend Rob Pattenson. He has been in Australia shooting his new film The Rover with Guy Pearce. The source also adds that Tamra is a gay rights activist who marched in last year’s Gay Pride parade. If this is all the proof the National Enquirer has to allege Kristen and Tamra are in a lesbian relationship then they are making this story up. A lot of women are very close friends and spend tons of time together. For example, Jennifer Aniston and Courtney Cox have been best friends for years and involved in almost every aspect of each other’s lives. No magazine has ever alleged that the two former Friends stars are in a lesbian relationship. The Gay Pride parade participants are not necessarily members of the gay community. We saw a few weeks ago on Bravo’s show Vander Pump Rules the staff of SUR decorating and riding on a pink float for the parade last summer. SUR owner Lisa Vander Pump, who is heterosexual, decided her business should participate in the parade because she supports gay rights. Gossip Police are reporting that they contacted someone in Kristen’s camp asking for a comment on the National Enquirer story. The response was a big laugh. Rob will be home soon from Australia. Kristen will be focusing all her attention on her boyfriend rather than Tamra, at least for a while. OK! Magazine is reporting that Kristen has a romantic night planned for Rob’s homecoming. She even told his friends he will have to wait to see him because she wants Rob all to herself. Perhaps Kristen’s new friendship with Tamra is filling the void until she can be with Rob again. Report: Kristen Stewart Cheating On Robert Pattinson AGAIN – Texting Rupert Sanders! Report: Kristen Stewart and Robert Pattinson Announce Pregnancy and a Baby!